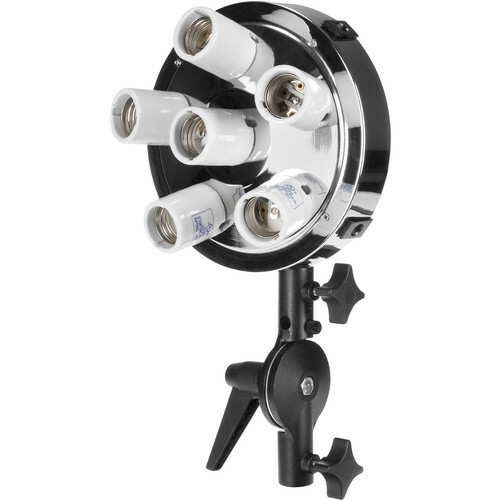 Building upon the design of the well-received TD5, the Westcott Spiderlite TD6 adds another socket for a total of 6 for increased light output. The light fixture accepts optional tungsten halogen (2800K) lamps up to 1200W maximum as well as fluorescents (2800-6000K) and a screw-mount flash. Three separate controls allow multiple combinations of bulbs together with no color shift. The TD6 has all-metal construction with 4 built-in receptacles for direct attachment of a 4-sided softbox without an adapter ring. This listing is for the fixture and Tilter Bracket only. Add the lamps of your choice. The Spiderlight TD6 is also available as the heart of several kits that include various combinations of softboxes, tilt brackets, stands, and cases. Three independent power switches on rear of unit allow dimming without color shift. All-metal construction, no plastic to break. Handle allows for rotation of a softbox from a vertical to horizontal position. Box Dimensions (LxWxH) 8.5 x 7.7 x 7.6"
Spiderlite TD6 (110 VAC) is rated 4.0 out of 5 by 9. Rated 4 out of 5 by Scott from Used with Chimera Lantern Was looking for a non-tungsten solution. The unit uses a standard type speed-ring built in so the lantern works perfect. It has 6 Edison sockets which is overkill with these fast cameras today. I use 3 Westcott 50w fluorescent daylight bulbs, 6 would be for lighting a large area. The bulbs each put out 200w equivalent tungsten. There are 3 switches controlling 2 sockets each. So you have option to switch off to your needs. Only draw back is its not the lightest thing when all rigged up. I was looking for an LED solution but no LED bulbs out yet that are color correct. I use it with an Avenger boom arm. Rated 5 out of 5 by Anonymous from Better than window light! The window in my appartment does not do a great job for newborn photos because of an overhang, and there is a 2 hour pocket of window when I can do my sessions. This has changed my photography for newborns! Rated 2 out of 5 by Anonymous from very cheap bulb holder I used two times this head and got broken inside ceramic holder. Rated 5 out of 5 by Bitter Jester Studios from Years of Use I've been using several of these for years. Primarily for interviews, but also for narrative. With the built in speedring head I've used these with lanterns and soft boxes large and small. I've used tungsten bulbs (primarily the 150 watt sunlite bulbs which are very compact) and 50w cfls. As a soft light these lights are extremely versatile and sturdy. I highly recommend. Rated 4 out of 5 by Lmillerpics from Beautiful light from the TD6 Purchased the TD6 specifically for newborn photography in my small 10x12 studio and it has been great. I'm using it with 6' PLM and it's perfect, beautiful, continuous light. It's not high powered like a strobe and that's why I chose it. It's pretty sturdy and well made. The lamps do get a little warm but it hasn't been a problem for 3 + hour shoots. Rated 4 out of 5 by Meagan from Great light, great customer service Bought this as a 2 pack kit, one was DOA but B&H's customer service sent me a new one asap without making me return the entire kit. Used the light a few times so far, color is a great match to sunlight, easy to mix with natural light without color conflict. Runs cool so works great without heating up my studio. Love that it has a kill switch on the cord so if I put the light overhead or high up I don't have to bring it down or get on a ladder to change. My one and only complaint is that I wish we had control over all the bulbs separately. There are only 3 switches on the back controlling 6 bulbs. Sometimes I only need a tiny bit of light and it would be nice to control one bulb at a time. Overall, super great light with lots of power. I would definitely recommend for video, portrait, and product photography. Rated 3 out of 5 by Anonymous from Spiderlite Light back is great. Slim chimeras 12 x 50 got holes burned in the sides after two weeks of use with westcott 150w halogen bulbs. All four of them have holes on each side.Sides of these chimeras are too close to bulbs. Rated 5 out of 5 by jwheat from excellent quality I've used a set of spiderlites for years and they are very durable, run cool, and create amazing studio and on-location images in daylight balance. hightly recommend these for continuous light! Will this fit multiple 105w CFL bulbs? Can I attached a Parabolic Umbrella to this light? I have the d5 and I am unable to use one with it. Can this mount to a regular light stand or does it require a specific westcott stand? Also, I have a Paul Buff 30x60 soft box and I'm wondering if this accepts any type of softbox mount? We use this on the Manfrotto rolling stand, you don't need a westcott stand. We have the Westcott umbrella and soft box on ours, so I'm not sure about other modifiers. I have a 12 by 54 strip bank that is not a Westcott item. It has metal support rods and a Bowens speedring (which I know isn't necessary with the TD6) Can I use it on the TD6 without damaging the light unit? I'm pretty new to this studio lighting thing and I don't know if the metal rods would be compatible. Charles, most standard 4 rod systems from quality manufacturers will work with a TD6 but I cannot speak to a non-specific model of softbox. Perhaps if you share your brand softbox someone will have a clearer answer based on experience.